CimeXa Insecticide Dust’s engineered silica composition quickly kills bed bugs, fleas, ticks, cockroaches, ants, silverfish, spiders, mites and drywood termites by destroying the pest’s waxy cuticle — resulting in rapid dehydration and death. It is also effective on pyrethroid-resistant pests, the company says. Featuring low toxicity and a broad label, CimeXa is odorless, non-staining and non-repellent, and lasts up to 10 years when undisturbed. It can be mixed with water and applied as a spray. 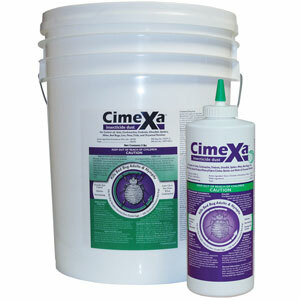 CimeXa is packed in 1-quart bottles (holds 4 ounces net weight) and 5-gallon buckets, which hold 5 pounds.